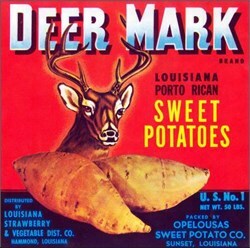 Beautiful authentic lithograph of the Deer Mark Brand of Louisiana Porto Rican Sweet Potatoes from Sunset, Louisiana. The image shows a deer looking a 2 yams ready to leave its mark . This item was printed in the 1940's and is approximately 9" x 9".